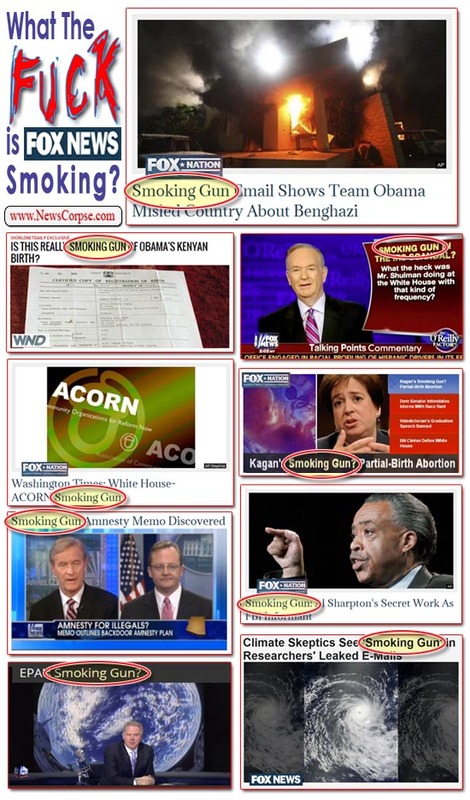 Smoking Gun Delirium Disorder: Or What The F**K Is Fox News Smoking? Generally when someone sees things that aren’t really there they are diagnosed as having hallucinations, perhaps in conjunction with psychological disorders like schizophrenia, paranoia, dementia, or other psychoses. But what do you call it when a cable news network suffers from these symptoms? It seems that everywhere Fox News turns they have visions of “Smoking Guns” that signal the Apocalyptic end of the Obama administration that they despise so fervently. Yet in every case their obsessive imagination dissolves into the ether leaving nothing behind but their impotent outrage. Get Fox Nation vs. Reality. Available now at Amazon. Smoking Gun In The IRS Scandal? Washington Times: White House – ACORN Smoking Gun. Kagan’s Smoking Gun? Partial-Birth Abortion. Smoking Gun Amnesty Memo Discovered. Smoking Gun: Al Sharpton’s Secret Work As FBI Informant. Climate Skeptic’s Smoking Gun in Researchers’ Leaked Emails. The latest example of this syndrome has manifested in the discovery of an email that the Foxpods are convinced reveals some sort of dastardly plot by the White House to define the tragic assault on an American diplomatic facility in Benghazi, Libya, as a response to an offensive video by an Islamophobic preacher. Their headline blares “Smoking Gun Email Shows Team Obama Misled Country About Benghazi.” It actually doesn’t show anything of the kind, but then none of Fox’s other smoking guns bore any resemblence to reality either. In fact, the whole conspiracy theory doesn’t make any sense because it wouldn’t matter whether the video incited the attack or not. And there is no doubt that if the video were the cause, Fox would be taking the opposite position and attacking President Obama for blaming the terrorists – you know, the cretins who actually slaughtered our citizens. With regard to the email, Deputy National Security Adviser Ben Rhodes wrote that among the goals of UN Ambassador Susan Rice, as she prepared for a series of Sunday morning news interviews, were “To underscore that these protests are rooted in an Internet video and not a broader failure of policy.” Note that it says “protests” (plural) making it obvious that Rhodes was not referring to Benghazi alone, but rather to numerous hostilities throughout the region. He doesn’t even mention Benghazi in the email until twelve paragraphs later, and then not in regards to this question. The delusional mindset of Fox and their conservative allies has even constructed a conspiracy around the fact that Ben Rhodes is the brother of CBS News president, David Rhodes. Therefore, there must be a plot between them to coordinate the reporting on this issue in favor of the President. Never mind that David Rhodes came to CBS from Fox News where he was the Vice-President of News and oversaw all of the blatantly partisan, pro-Bush coverage from 9/11 to Katrina to Iraq to the Bush economic collapse. Also, it was under David that CBS broadcast the recent (and now discredited) Benghazi story on 60 minutes that was so harshly critical of Obama. It’s fair to say that David and Ben have different political views. But that didn’t stop the ultra-rightist Heritage Foundation from juicing up the sibling conspiracy, complete with a Twitter-friendly graphic. Clearly Fox News is deeply disturbed and fixated on finding evidence of malfeasance that will bring the Obama administration crashing down. But when they see smoking guns in every direction, haunting them in their waking hours as if there were substance to them, it really is time to seek professional help. The parade of alleged smoking guns have all amounted to nothing but mirages of the feverish hopes embedded in the twisted psyches of Fox News. And this new one will suffer the same fate. Judicial Watch sued for Benghazi-related e-mails through the Freedom of Information Act, and that e-mail was released as a result. And so this e-mail doesn’t have anything to do with Benghazi? What are you smoking? I mean, the THC levels in pot have been increasing dramatically over the years, but I didn’t think they rose that much. Even if this e-mail wasn’t primarily about Benghazi, it still continues to expose the lie that Chris Matthews apparently still believes about this being caused by a video. Actually what Mike was saying was that the email was saying something about Benghazi that was already addressed and irrelevant anyway (remember, it was NEVER the position, at ANY time, of the administration that the video and ONLY the video was to be blamed for the attacks). But of course you had to chime in with your usual attacks which havde absolutely nothing to do with what the article is about. That shows you post your screed without even reading. And look stupid in the process. What does this email by Rhodes tell us we didn’t already know? After all the debunking by all the Congressional committees that were tasked with investigating this, what new revelation has been exposed? This is the classic way brain washing is conducted. W’s administration said “WMD” over and over until the mushrooms believed it. Now you see fox and the Lindsey Grahams of the GOP doing the same thing with Benghazi. The “smoking gun” terminology was used by W as well and sounds so credible to the brain dead. Fox knows their audience is rather ignorant and pliable. They just have to hear it over and over again and they become putty. Besides, look how President Romney is handling things with……oh, wait. Sounds like Clicking your heels together and repeating “Fake Scandal” until somebody believes it? Fox News viewers are fully well intelligent. They know something is seriously wrong about this scandal, no matter how many times the left tries to wish this away. Yep. Those “fully well intelligent” Fox News viewers are right that there is something “seriously wrong about this scandal.” And your a fully well good representative of their seeing of things well. Thanks. Of course. If you have already pre-determined what the “truth” is, no amount of evidence to the contrary will matter. It’s like Holocaust deniers: they don’t WANT it to be true, so it isn’t, and all the evidence in the world makes no difference. You’re the type of person who would beat them until they “confessed” and then claim vindication! Name it, Scott. What is it that makes this latest email or anything about Benghazi any more scandalous than the drivel that has already been debunked? Say the one new thing that makes this the horror that you and yours believe it to be. Give us something credible and intelligent, not the propaganda you’ve been brain washed with. Benghazi Fever is a serious infection which makes the brain swell and the infected lie. It occurs after one has come into contact with the feces flung by conservatives as they try and smear Liberals. It also can happen after breathing in the noisome and noxious emissions of the right-wing blog-o-sphere.